A collection of data and associated behaviors to accomplish a particular function, defined as a Service Definition (i.e. a collection of characteristic attributes). Primary services are discovered by a GATT Client via a "GATT Primary Service Discovery Procedure". Services are classified as "Public" or "Private"
Declaration attribute permissions are always set to "Read with No Encryption" so as to be always discoverable by a Client. 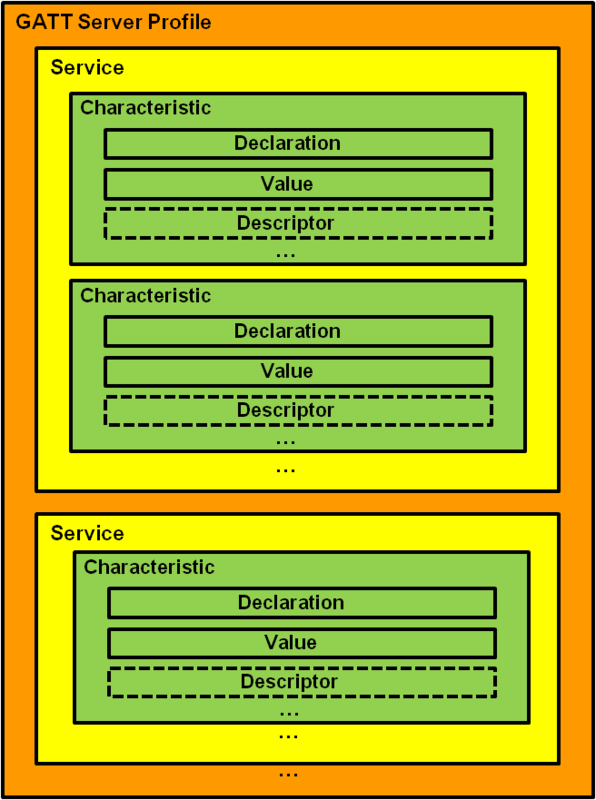 A Characteristic can optionally contain Descriptor Attributes, described below. Contains a user-readable description for the characteristic in which it is placed (i.e. "Temperature in the Living Room"). A switch, enabling/disabling server-initiated updates. This is a very commonly used descriptor. The Client-Server nature of GATT data communications has a drawback in that the Client must typically poll for updates of a characteristic on a Server. The CCCD provides a mechanism to enable Server-Initiated Updates, whereby the Server can asynchronously push updated characteristic values to the Client, without the Client having to poll for it. The Client must enable this Server-Initiated update mechanism by writing to the corresponding CCCD before the Server can start sending them. 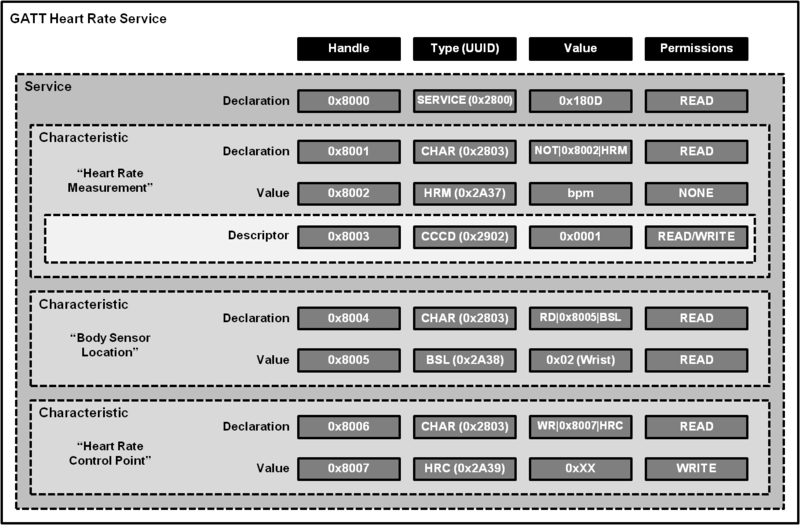 Declaration, Value and Descriptor Attribute Types have pre-defined UUIDS provided by the Bluetooth SIG. 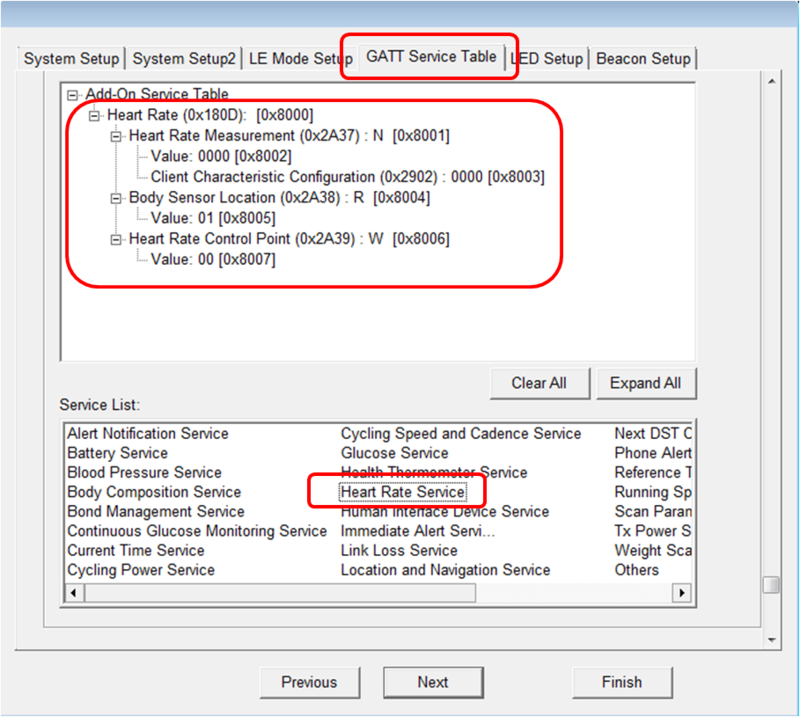 The following URLs provide useful links to these references, which will be helpful in deciphering attribute databases (see GATT Heart Rate Service below). Note that the Attribute Handle values are automatically assigned by this tool (starting at 0x8000).